Marguerite, blind and despised, with only two silent, watchful owls as her companions. Her eyes. Megan and Marguerite come to depend on one another. Theirs is a strange relationship, but the deserted, almost derelict house, they inhabit is the perfect place for hiding secrets. A haunting tale of loss and revenge, of friendship and the power of forgiveness. As soon as I read the blurb for this book several months ago, I was fascinated. It said so much, yet didn't say anything at all. I think it was a perfect way to grab the reader's attention because the air of mystery certainly got me interested. Megan is running from her life, the past, and the devastating event that forced her parents to shut down. She lives with the guilt and is constantly haunted by dreams of her brother. When she comes to a derelict house she thinks is empty but finds there's a blind woman living inside--who offers her a place to stay if she'll help her--Megan decides to stay for a while. The town of Morne is a strange one. Mostly abandoned, it's obviously hiding a terrible secret that no one wants to talk about. Something horrible enough to blind a woman. Marguerite seems like a cold, isolated and lonely woman taking advantage of Megan's situation and kind intentions, but there's so much more to her. She can't see but she has two owls that act as her eyes. When a boy call Tom is thrown into the mix, Megan finds herself caught between their friendship. Wanting to help Marguerite, as well as wanting to learn to be free with Tom by her side. Though she doesn't know just how much she'll end up caught in the middle. 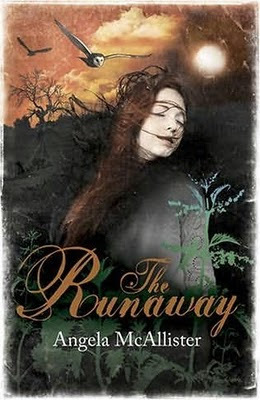 The Runaway is a lovely, moving, and very lyrical story about three lost souls with their own personal baggage and memories, who manage to find each other when everything and everyone else has failed or shunned them. It's a beautiful tale about a very damaged and guilt-ridden young girl who believes that the death of her brother is all her fault, when in actuality it wasn't. Still, when she'd lived most of her life not being good enough because she was a daughter instead of a son, it's not hard to understand why she'd jump to such a conclusion. I absolutely devoured this book. I picked it up this morning and just finished it. Although the book's pretty thin, it's beautifully made and the story so deep and haunting that I know it'll stay with me for years to come. This is one of those books that has to be read to totally understand just how good it is. I loved the complexity of each character, the atmosphere of despair, and the imagery of birds.